Yesterday IndustryGamers reported that, according to one analyst, EA are looking to get 2 million subscribers when Star Wars: The Old Republic releases next year. 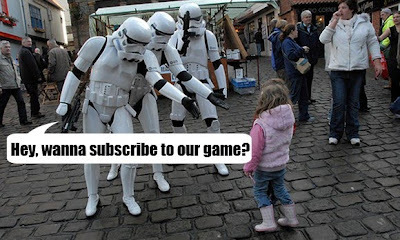 Many have since speculated that EA needed this amount of subscribers for the game to break eave. In a genre where only one game has ever exceeded two million subscribers at $15 per month, that’s a very high standard to put yourself up against. Then again, we are talking about Star Wars, beloved by geeks the world over. We’re also talking about BioWare, who have blown many gamers away with the awesomeness of Mass Effect 2 and Dragon Age: Origins. Two million is possible worldwide, right? The other issue that I’m hanging on is the fact that 2 million subscribers is a far fetch for the North American and European markets. The key word in this sentence is subscribers. While Aion may tout a very significant three million users worldwide and World of Warcraft holds up the 11 million subscribers sign, the Asian market is not full of 15 dollar a month subscribers. As we dislike microtransactions, they dislike a pay per month scheme. Because of this, it’s difficult to really put a solid figure on the number of accounts in Asia. Plus, there is also the fact that some of them may never spend the magical $15 per month while others may spend well over that. World of Warcraft has only hit approximately 2.5 million users in North America, which draws the issue of obtaining two million subscribers into question. We have a market where, right now, 300,000 users is an impressive amount for a game that isn’t World of Warcraft. Going from 300,000 users to two million users is a very large divide for a game to conquer.